Bengaluru, India's multi-wavelength space telescope AstroSat had measured the X-ray polarisation of the Crab pulsar (star) in the Taurus constellation, said space agency ISRO. "AstroSat accomplished the difficult task of measuring X-ray polarisation of Crab pulsar in the Taurus constellation during 18-months of its study for the first time," said the Indian Space Research Organisaion (ISRO) in a statement here on Monday. ISRO launched its first dedicated space observatory AstroSat on a Polar Satellite Launch Vehicle (rocket) on September 28, 2015, from its spaceport at Sriharikota in Andhra Pradesh. "The telescope measured the variations of polarisation as the magetised object (pulsar) spins 30 times per second," said the statement quoting from a paper published in "Nature Astronomy" journal. A pulsar is a rotating neutron star or white dwarf, which emits electromagnetic radiation. Neutron stars and black holes are examples of such objects. Taurus is the second astrological sign in the present zodiac. It spans the 30-60th degree of the zodiac. The landmark measurement by the satellite's CZT (Cadmium-Zinc-Telluride) imaging instrument challenges theories of high energy X-ray emission from pulsars. "Indian scientists using data from the CZT Imager have performed the most sensitive measurement of X-ray polarisation of the Crab pulsar, the rotating neutron star which is the main energy source of the nebula," the scientific paper pointed out. 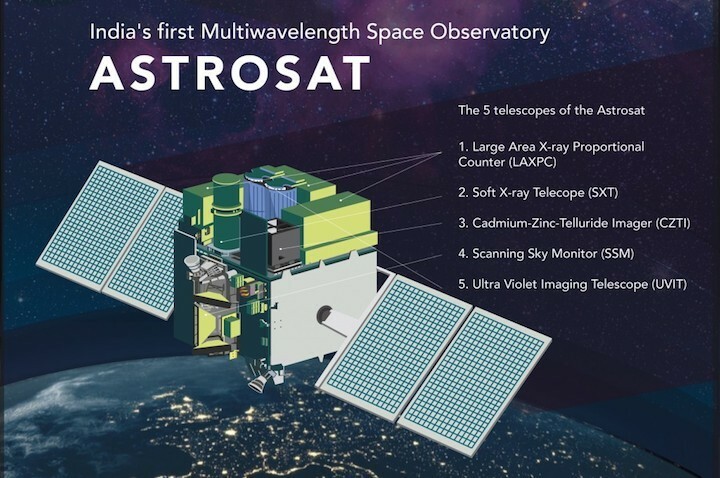 The 1,513 kg space observatory built at a cost of Rs 180 crore has five scientific instruments to study celestial objects in the universe for the first time at optical, ultraviolet and x-ray wavebands simultaneously. The instruments are a soft x-ray telescope, an ultraviolet imaging telescope, an imager and a scanning sky monitor. "The universe is home to many such exotic objects with conditions quite different from the Earth. It is essential to study them to ensure our predictions describe what goes on in and around them. They are less than a few tens of km but have masses more than that of the Sun and are known as compact objects," noted the statement. X-ray polarisation measurement is so difficult that so far the measurement obtained worldwide is for the pulsar in the Crab Nebula - the ghostly remains of a massive stellar explosion known as supernova, observed in 1054 AD. With mass condensed in a small volume, the pulsars possess strong gravitational and magnetic fields, both trillion times that on the Earth. They are also sources of intense X-ray radiation, electromagnetic waves similar to light but have ten to hundred thousand times higher energy, which carries vital clues to understand them as well as the physical processes responsible for the radiation. Astronomers have studied properties of this radiation to make a picture of compact objects and their surroundings. "The idea of using CZT Imager for X-ray polarisation measurement has been around for a while, but this is the first time the idea was tested on ground before launch and then employed in space. This makes our measurements credible," said ISRO's Ahmedabad-Physical Research Laboratory (PRL) Professor Santosh Vadawale in the paper. Another feature of the measurements is the study of polarisation properties at different rotation phases of the pulsar, which has not been done so far, reiterated Vadawale, lead author of the paper and part of the CZT Imager team. According to Mumbai-based Tata Institute of Fundamental Research (TIFR) Professor and Imager's principal investigator A.R. Rao, the team had to observe the Crab pulsar many times and combine data of months given its small rotation period. "To get the micro-second accuracy for combining the data, the AstroSat team sought help from one of the world's best radio telescopes - the Indian Giant Meter-wave Radio Telescope (GMRT), at Khodad near Pune. Professor Bhal Chandra Joshi and a team from NCRA, Pune, monitored the radio pulsations from Crab with GMRT and Ooty radio telescope, corrected anomalies and provided accurate ephemeris to the imager. The CZT-Imager was built by a consortium of Indian academic and research institutes, including ISRO's Vikram Sarabhai Space Centre at Thiruvananthapuram and the Satellite Application Centre in Bengaluru, the Inter-University Centre for Astronomy and Astrophysics (IUCAA) at Pune and the Space Application Centre at Ahmedabad. PRL provided the polarisation detection algorithm and ground calibration.